The makeup artists who worked the red carpet circuit had a difficult task - making sure actresses like Anne Hathaway and Rose Byrne had flawless makeup that stayed in place all day and night. Their must-have product? Setting powder, of course. "Even a minimal amount of powder will set your makeup, smooth your skin, and give you longer wear," Nars Lead Makeup Stylist Jenny Smith told us. "From a makeup artist point of view you should always use some sort of powder!" However, it's not always the easiest product to apply - especially when we're already fighting off dry winter skin. Lucky for us, she shared her tips on daily wear, and why face powder is worth the extra step in the morning. 1. Always match your skin. "Whether you're planning on being in harsh lighting or taking a lot of photos, your powder should always match your skin," says Jenny. 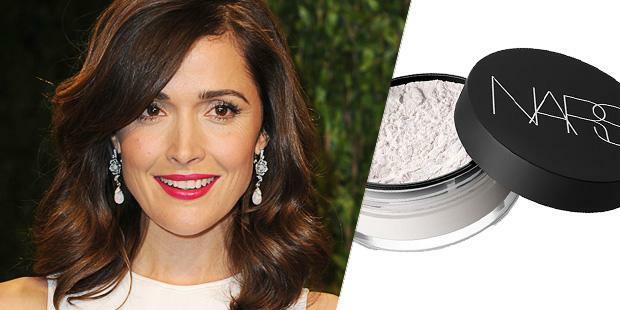 Be careful: your powder's color can change once it's been on your skin for a few hours. "If you're going to be in hot lighting or think that you may get shine, be especially wary not to go darker because the powder may oxidize on your skin and become even darker as you're wearing it." 2. Avoid the outer edges of the face. Jenny says, "Powder should be primarily applied to the center of the face; in the T-zone, on the outer corners of the nose, and to your chin and cheeks. Avoid going too far on the outer edges of the face as you still want the natural radiance of your skin to show through." She suggests applying a highlighting product at the edges instead; most people don't get shiny around the perimeter of the face, anyway. 3. Boost concealer with loose powder. Use a powder such as Nars Light Reflecting Loose Setting Powder ($34, narscosmetics.com) to keep concealer in place all day. Make sure to always use a loose powder, not a compact, because it won't fall into line creases, Jenny advises. 4. Create a natural-looking finish. Powder shouldn't look dry on your skin. To make your powder invisible, dampen a makeup sponge and pat it over the skin. This removes excess product and creates a silky finish. 5. Touch up with blotting papers. Instead of piling on layer after layer of powder throughout the day, control excess oil with blotting papers, like Bobbi Brown Blotting Papers ($20, bobbibrowncosmetics.com) instead. Layers of powder can look cakey; oil absorbing sheets remove the grease without messing with your makeup. Does Where You Live Determine How Much Makeup You Wear?